Last major update issued on May 29, 2010 at 05:20 UTC. The geomagnetic field was quiet to unsettled on May 28. 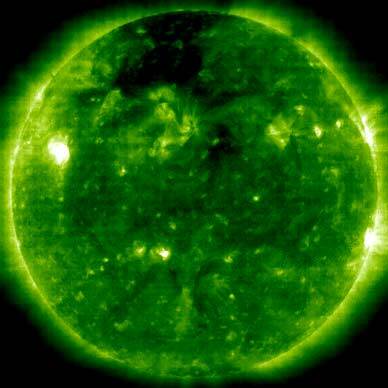 Solar wind speed ranged between 335 and 412 km/s under the influence of CMEs observed on May 23/24. A weak solar wind shock was observed at SOHO at 02:19 UTC with a sudden increase in solar wind speed from 347 to 392 km/s. This was the arrival of the CME observed on May 23. The interplanetary magnetic field has swung moderately strongly southwards early on May 29 and minor or even major geomagnetic storming is possible for the remainder of the day. Solar flux measured at 20h UTC on 2.8 GHz was 73.2. The planetary A index was 10 (STAR Ap - based on the mean of three hour interval ap indices: 10.4). Three hour interval K indices: 13223233 (planetary), 13223122 (Boulder). Region 11072 decayed slowly and is rotating out of view at the southwest limb today. [S770] This region emerged on May 28 in the northwest quadrant. Location at midnight: N18W45. [S771] This region rotated into view a few days ago but didn't develop spots until May 28. Location at midnight: N12E47. May 25-28: No obvious Earth directed CMEs were observed in LASCO or STEREO images. 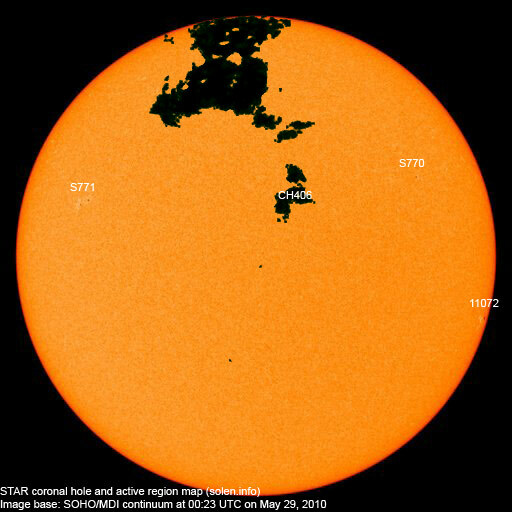 A recurrent coronal hole (CH406) in the northern hemisphere was in an Earth facing position on May 28. CH406 has diminished over the last few days. Processed SOHO/EIT 195 image at 00:00 UTC on May 29. The darkest areas on the solar disk are likely coronal holes. The geomagnetic field is expected to be quiet to minor storm on May 29 due to CME effects, isolated major storm intervals are possible. Quiet to unsettled conditions are likely on May 30 while a high speed stream from CH406 could cause unsettled to minor storm on May 31.